The Two Sides of Ana: Episode 37 | TeleNovela Channel - Bringing you closer to lifes drama. Vania moves back to her apartment as Humberto consents to Ignacio’s desire for a divorce. 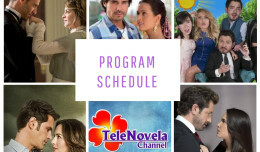 Meanwhile, Cristina discovers Javier and Tina’s relationship while Ignacio brings news to Vicente that Marcia is now Humberto’s new secretary.